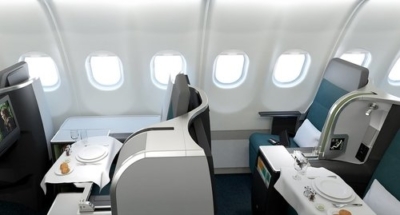 Australian Business Traveller, of all people, has got exclusive images of the business class seat that Aer Lingus is using on its new A321LR fleet. Aer Lingus has 14 of these aircraft on order. Whilst they will look like standard short haul aircraft from the outside, they have capacity to fly transatlantic. Aer Lingus has also announced plans to use them on selected short haul routes, both to keep the aircraft busy during the day and to allow premium passengers a good connection experience. 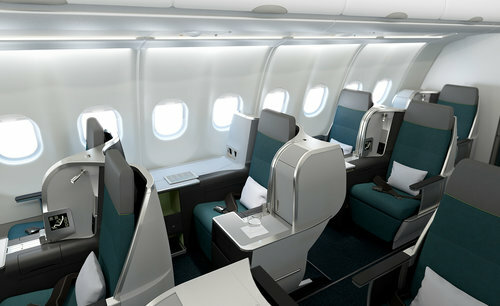 There will be 16 seats per aircraft with a staggered layout in order that the feet of the person behind can fit under the seat in front. This is a layout which usually works well unless you don’t like your feet being in a cubbyhole. British Airways is launching its ‘100th birthday’ advert this morning. It is an interesting piece with a mix of celebrities (Gary Oldman, Olivia Colman, Paddington Bear Winnie the Pooh) on a Boeing 787 alongside members of the public representing the full spectrum of British society. There is also a section filmed in the First Wing at Terminal 5. Is is better than Virgin Atlantic’s 25th birthday ad (YouTube link)? Could anything be? Find out at 11.30. Finally, a hotel update. 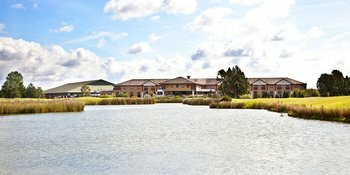 The Crowne Plaza Resort Colchester – Five Lakes, one of the few IHG resort properties in the UK, has left the chain. It is still on the IHG website but not bookable. The official hotel website is here and shows it operating as ‘Five Lakes Resort’. OT: Made an AA flight booking via Amex Travel last night and wants to change the dates now. Called Amex just now and they informed me I’d have to pay a change fee now since the cooling off was only until midnight yesterday. Doesn’t make any sense to me as it says 24 hours on AA’s website. Shall I push further or contact AA? Thanks. Indeed, and Paddington was from Peru so can’t truly be classed as “British society” 😂. OT – Eurostar points… do these still expire after a certain period of inactivity? AwardWallet told me they did, but I’m not sure if as part of the transition from the old scheme they automatically input the old expiry date and stopped tracking it… Someone on Twitter said that they don’t expire but would prefer to have additional backup! You just need to earn one point every two years. The AW date doesn’t work IME. Thanks – not sure why their Twitter rep said not to worry… is there anything you can do other than booking a train or transferring Amex MR? The Plaza Premium in T2 Arrivals is walk-able in 5 minutes from T1. Its just around the corner from the train. Highly recommend, decent food and showers although staff are a bit surly. Amex plat (alone) and Priority Pass accepted. Thank you, I assume once you are out of immigration you can enter this Lounge. You can also book massages I think. OT: I’ve always been able to select exit row seats (European flights) for free with my BA silver status. Tried a dummy booking yesterday LHR-ORD and during the process I was asked to pay £62 for exit row. I guess it’s not free for long haul flights? Selecting exit row seats on long haul flights is only free for Gold and GGL. OT: sorry for the OT, any one know if I choose seats today as a Silver will we booted out of them when I turn Bronze at the end of the month? Not flying till June. Trying for exit row obviously. Cheers. Hi Leo, IME (as we had the same silver/bronze downgrade seat booking scenario last year) this will not happen and the seats you choose now will remain yours regardless of BAEC status at the time of flying. Oh Cheers! Will give it a go then! Mostly you’re OK. I believe if they change the plane you could lose them. They reassign on current status at that point. Yes I understand – as it’s only Portugal I might well risk it. No, not been mentioned. Or, more precisely, the flights probably are bookable as standard Aer Lingus flights will be switched nearer the time. Thank you, thank you, thank you. I have a hotel booked in NYC with this offer, but I hadn’t even thought to check my supp Plat card. Now looking to extend my stay, or do a two centre. Yes thanks – I’ve just used this today on main card and supp. Had a successful email on the main card but not supp. So will sit tight. Can you get referred / self refer from another card to the Nectar Card for an increased Bonus?